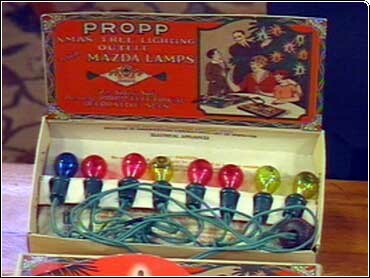 Electric Christmas lights for the home first appeared on the market 100 years ago. The Saturday Early Show's Collectibles Expert Tony Hyman explains some are worth more than others. A string of eight colored bulbs cost $12 when wages were a buck a day and only one home in 50 had electricity. By the 1930's, General Electric, Westinghouse and Noma were cranking out inexpensive strings of painted lights shaped like birds, buildings, bells, Santas, sleighs, and snowmen, even comic strip characters and scary faces. To further brighten the holiday season, hundreds of millions more lights were imported from Germany and Japan. The most exquisite and expensive 1930's light was the Wonder Star made in the United States. Available in dozens of sizes and color combinations, they cost a day's wage in 1939. Today they cost anywhere from $15 to $500. Fifty years ago, bubble lights were the rage. A boxed set today brings $40 to $500, depending on which one of these types you have. To determine the value, each light must be examined individually, because scarcity, overall condition, and amount and quality of paint are important. Fine condition figurals can bring from $5 to $150 a bulb, and even dead bulbs can be collectible. Boxes and strings are worth saving, too. So be careful when you haul the lights down from the attic and decorate for the holidays! For more information on collectible Christmas lights, contact David Speck, at his email address dspeck@relax.com.